Some time last week, I spotted this polish over at Polish This. I instantly fell in love with it and promptly went off and purchased it. This is Color Club's Covered in Diamonds. This is an old school flakey to me, exactly like my old Ulta 3 Wild and Crazy. What I mean by old school is that these flakey bits are irregular and rough, and much larger pieces than current flakes seen in the Nfu Oh or Inglot flakies. 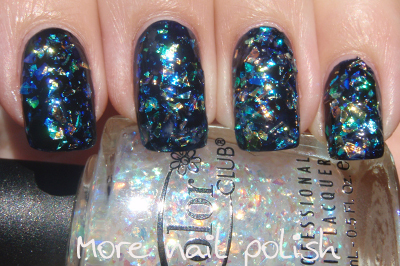 This is one coat of Ulta 3 Midnight with two coats of Covered in Diamonds, then two coats of top coat. Photo taken indoors. I was really worried it was going to be seriously rough, but what I did after the first coat of top coat, was press down on the nail gently, pressing all the rough bits of the flakey into the soft polish. Then the second coat of top coat really smoothed it out, leaving it almost smooth. I did find this polish really gluggy, in fact I added about 10 drops of thinner to this brand new bottle, otherwise I would never have been able to get it on my nail. 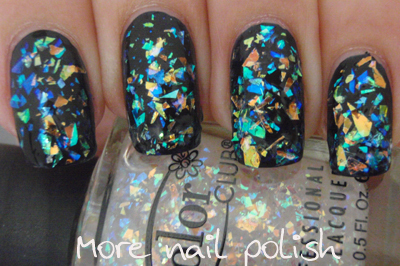 There are so many colours in this flakey polish, blue, green, orange, yellow. I personally think it looks best over a dark colour, just like all the other flakies. I will have to try with different coloured bases. WOW that is beautiful! I don't think I've ever seen a polish quite like that. I think it would look really pretty over a pastel. Thanks ladies, it is beautiful and does look like frost. I actually got it off ebay, as we can't get Color Club locally here in Australia. It wasn't very expensive either. I need to get mine out the cupboard. I got it from mbeautylounge to little old Australia. Wow that is glorious! I must get it! This would look amazing over a deep blue. I think it would look like opal!! Soooo pretty!I've been loving flakies lately and I'm most def getting this! This is so pretty, it reminds me of a stained glass window.